Welcome to Tutson's landscaping/Borders page, We install many different types of borders and can help you with many of your landscaping solutions and ideas. If you have and idea or need one give us a call and we will try to make it reality. Landscpaping & Borders add the finishing touches to any home. Planning a good landscape design is important before doing the work. There will be many factors to consider before planning your landscape design. The waterflow from the natural terrain, outside lighting needs, and types of materials to be used are just a few of the many issues that need to be determined by professionals. 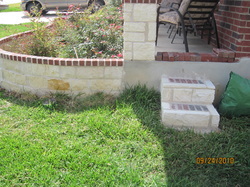 Let us help you design your beautiul yard/garden to be the envy of all your neighbors and a delight for your pleasures.